The City of Gloucester City is moving forward with the repairs needed at the Chatham Square Apartments. The City purchased the 100 apartment complex, Route 130 and Klemm Avenue several months ago for $4.1 million. Constructed in the late 1960’s by a local builder it was originally named the Reading Manor Apartments. The red-brick buildings were attractive, the lawns and landscape were well kept and there was also an Olympic size swimming pool for the tenants to use. The interior of the one and two bedroom apartments included wall to wall carpets, air conditioning, new appliances and modern day kitchen and bathroom fixtures. It was a welcome addition to the City’s housing stock. Newly-weds and senior citizens made up the majority of the tenants living there. But in recent years the property has spiraled downward. In 2006 the Gloucester City Housing Department cited the owners, of what was now known as the Chatham Square Apartments, for violation of various housing problems. Those included the conditions of common areas, failure to obtain certificates of occupancy, interior life hazard issues and code enforcement violations, to name a few. In a decision dated October 24, 2006 the Municipal Court fined the owners $96,000, plus $17,000 per day until the numerous housing violations was corrected. 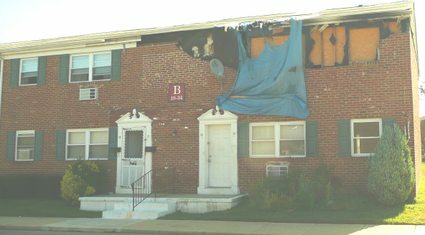 Today as you approach the entrance to the apartments driving in from Route 130, one of the first things you notice is the corner of a damaged apartment building. The fire at apartments 19 and 20 occurred in February 2008. They remain vacant with boarded up windows in front and back. The gutters are damaged; bricks are missing from the façade. A torn blue plastic tarp flaps in the wind hanging precariously over the hole in the front of the building. Councilman Nick Marchese said the City is waiting for the insurance claim for the damaged apartment to be paid before proceeding with repairing this building. Gloucester City Mayor Bill James told Philadelphia Inquirer reporter Edward Colimore ( September 12, 2008) "It was a fantastic place to live 30 years ago, but the problems there got more and more serious. In the last 10 years, the place went right down the tubes. It was placing a strain on the police and fire departments, school system and other services." James said the city is "trying to take care of the health and safety issues first, so everyone's quality of life improves." The city is also going through financial records to determine if those in the 41 occupied Chatham Square units are legitimate tenants. Thirty-two residents were sent eviction notices this week for nonpayment of their rent or security deposits, said John Kearney, the city's attorney. Court hearings will be held next month. Kearney said when the City took over they found the building’s booking system was a mess. And the Chatham Square's management company has struggled to make sense of the records. Tenants are being asked to produce proof of their rent payments. And in some cases show proof that they made a security deposit. Mayor James said plans call for residents, now scattered across eight buildings, to move into three rehabbed buildings by Dec. 1. The city will refurbish the vacant rental units later. It also has hired landscaping and trash-disposal services. Philadelphia Inquirer (September 12, 2008) "There hadn't been any maintenance here in 20 years," said John Zelinski, maintenance manager at the site, as he toured the complex with a contractor who will upgrade the laundry rooms with new appliances. "It's like Christmas for the residents when I come to visit," said Zelinski, who has been installing new smoke detectors. Residents pay monthly rent of about $600 to $800. In December 2007 council passed a resolution to enter into an agreement with the owners to purchase the property. At the time Councilman Marchese said the apartments would be demolished and single family homes would be built. Both he and Mayor James said then that this idea is in the early planning stages. Now that the City owns the property the long range plans for the complex is uncertain. Somewhere down the line it could eventually be sold for commercial development or as a site for single family homes. As for now the mayor has said repeatedly the City’s short term plan is to renovate the units and make them livable for the residents that are living there now.